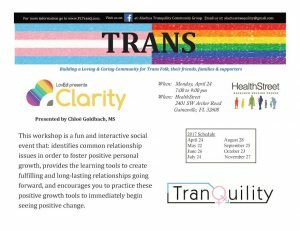 At the next TranQuility meeting Chloë Goldbach will lead a fun and interactive social event exploring issues surrounding love and relationships. This workshop seeks to identify common relationship issues and seeks to foster positive personal growth, provide the learning tools to create fulfilling and long-lasting relationships, and encourage people to practice these positive growth tools to immediately begin seeing positive changes in peoples lives and relationships! All are welcome to attend this meeting. When: Monday, April 24 from 7-9pm.